The badly burnt fishing boat at Number 66 Village, Corentyne. A fishing boat was Saturday burnt at Number 66 Fish Port Complex, Corentyne and a man who sought to provide assistance drowned. Fire Chief, Marlon Gentle confirmed that the incident occurred around midday. 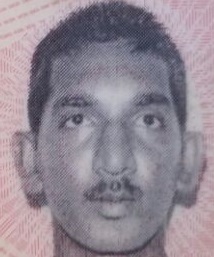 The drowned man was identified as 42-year old Bhairo “Geer” Persaud. His body was discovered in the vicinity of the fire scene. Other sources said Persaud reportedly attempted to assist in containing the fire when he fell overboard and met his demise. Sources said the fire began while someone was loading fuel at the same time another person was cooking on a stove in the fishing boat. Some of the fuel spilled and made contact with the exposed flame resulting in the explosion. 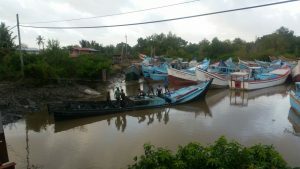 At the time of the incident, fishermen were loading the fishing vessel with supplies to go out to sea.